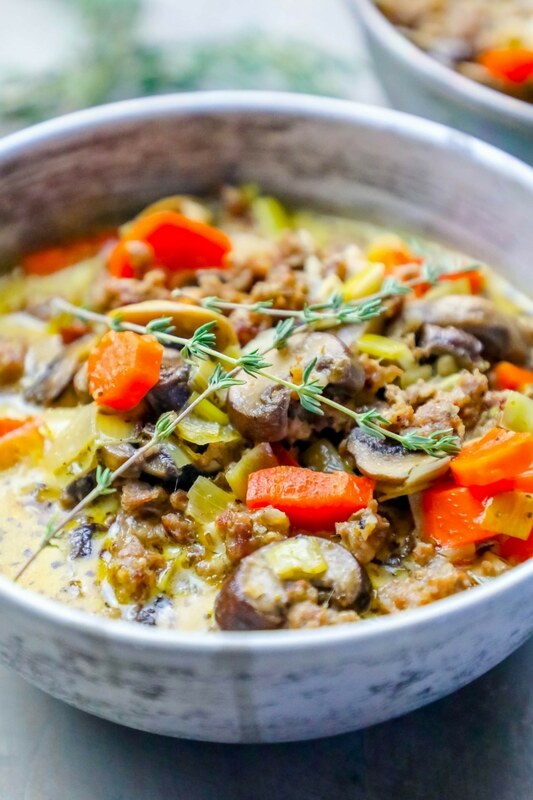 This creamy sausage and mushroom soup is a simple one pot mushroom and sausage chowder that is bursting with hearty, delicious flavors – and is oh so creamy – without any processed and canned soups – even though it’s lightening quick to make! 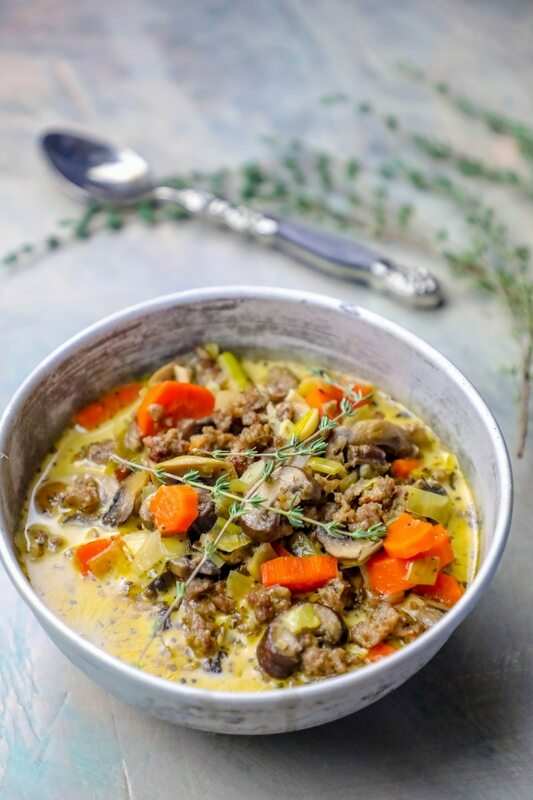 There is no need to use a canned soup mix in this incredibly indulgent soup – we’re building rich, delicious sausage and mushroom flavor quick in just one pot using fresh foods for a delicious creamy low carb soup that even works in a low carb keto or paleo diet! 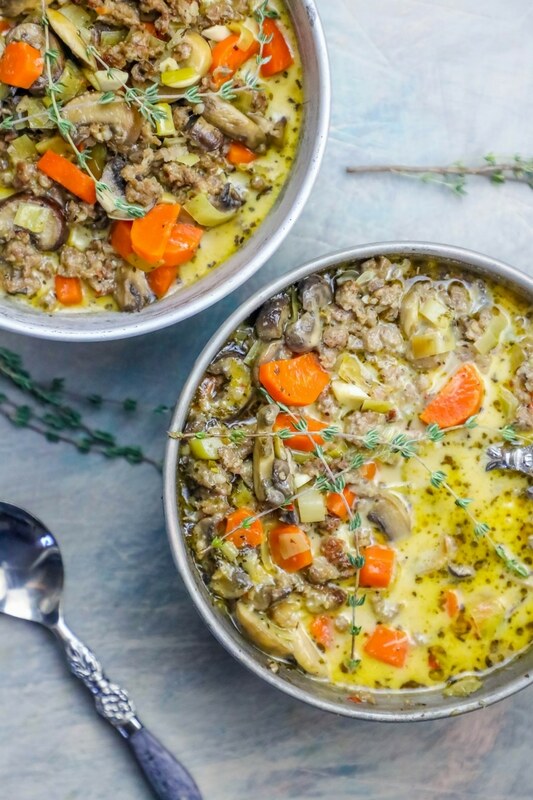 This soup is so comforting and delicious, don’t be surprised when you’re making this hearty sausage and mushroom soup over and over again… it’s totally addictive! 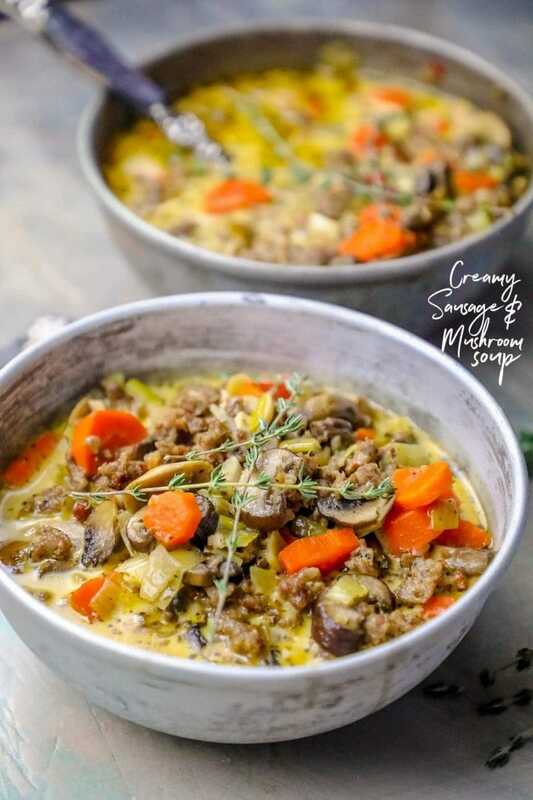 If you love this easy and indulgent sausage and mushroom soup, be sure to check out some of my other hearty and quick one pot recipe favorites – each under 30 minutes and just one pot to prepare! 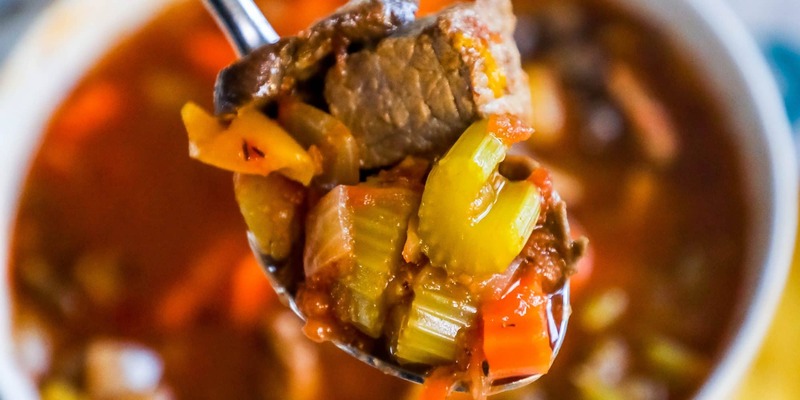 Instant Pot Skinny Steak Soup- Just 3 Points! In a large dutch oven or stock pot, heat oil on medium high until shimmery. 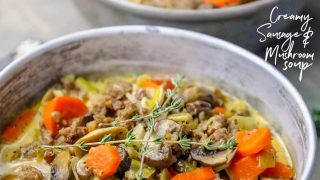 As sausage starts to brown (after about 5 minutes), add garlic, onion, celery, and carrots. Let brown, stirring occasionally to prevent sticking or burning, about 10 minutes. Add mushrooms halfway through vegetables and sausage are browning. 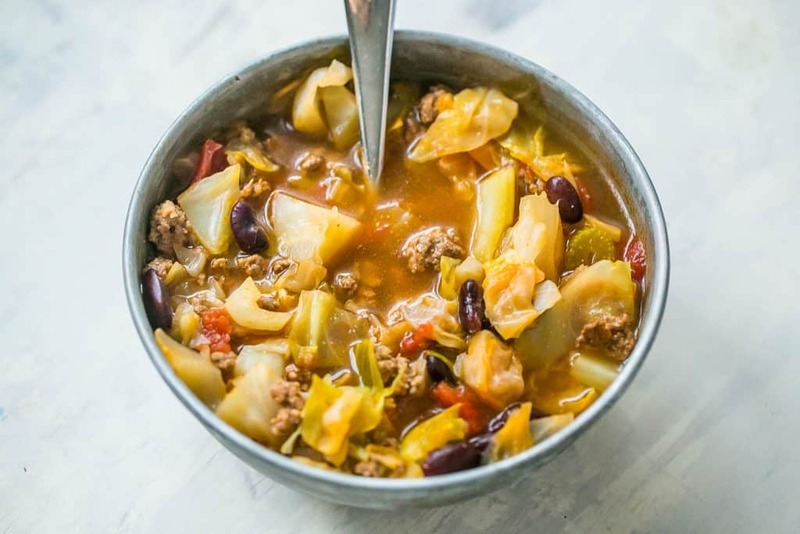 Add stock and turn heat to high, let reduce by half, about 5 minutes. 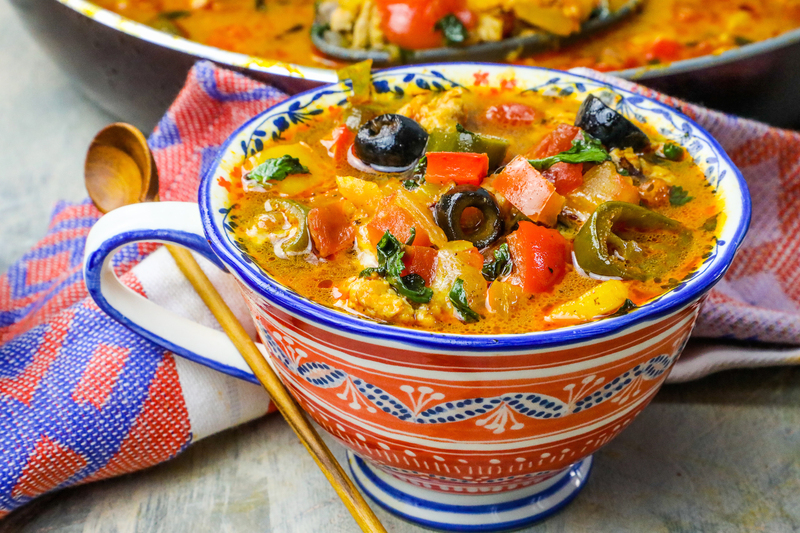 Remove from heat and stir in heavy cream, whisking as you add to soup. Return to medium high heat for 5 minutes (to a rolling boil). 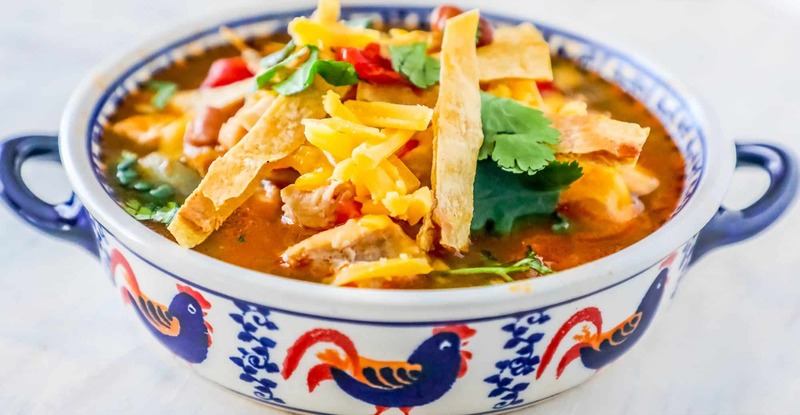 When soup has thickened slightly, it is ready to serve! Garnish with parmesan cheese and fresh herbs, if desired.